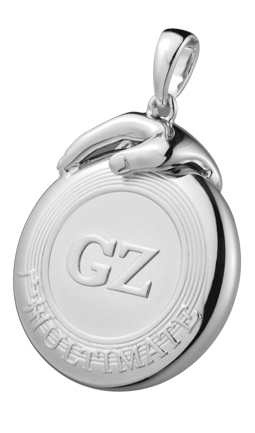 The 925 silver Ultimate GZ Teammate Disc Pendant features a flying disc with the characters ‘GZ’ in the center. This represents Guangzhou, the team sponsored by Vinqui at the 2011 China Ultimate National Championships. The disc is gripped by the hand of an Ultimate player ready to throw a push pass. Running along the bottom of the disc is the Chinese and English words for ‘Ultimate’.